Keith Houston of Shady Characters has an interesting piece at BBC—Culture on the history of punctuation. It’s always great to lead the world in anything: how great to know that it was the laziness of Scottish (and Irish) monks that lead to the invention word break! It is heartening to us book makers to learn that punctuation symbols only settled down to a more or less standard format once they were set in lead by Gutenberg. Robert Gray has a nice column about theatrical adaptations of books at his blog Fresh Eyes Now (originally from Shelf Awareness). Adapting a book for the stage (or film or TV now) is obviously a delicate task. Slightly unkindly Max Beerbohm said this problem was solved by George Bernard Shaw by simply turning his tracts into dialog, and getting his characters to read out the “book” on stage. Henry James (like Dickens) strove for stage success and it eluded his grasp, yet The Turn of the Screw makes a great opera, and has been filmed several times. Others of his books which have been made into films are The Bostonians, Daisy Miller, The Europeans, The Golden Bowl, Washington Square, The Portrait of a Lady, What Maisie Knew, and The Wings of the Dove. The Green Room is based on three James stories. Would knowing this help him overcome the disappointment of his play Guy Domville which never took off on the stage and has yet to find Hollywood favor? You’d think Henry James’s style was about as far away from what’s needed for success in the cinema as it’s possible to get, yet good films have been made. It just shows that Hollywood can afford any kind of conversion work and has writers who can play with the most rebarbative text. Here’s news from The Independent of the BBC’s new 12-part radio adaptation of War and Peace. I am not quite sure why we should be surprised there are to be cuts. If there are to be 12 parts, each would have to be a couple of days long if the whole thing was to be included. A Waste of Time by Robert David MacDonald (1980) was an adaptation and extreme abbreviation of A la recherche du temps perdu, played in one evening. Of course I don’t know whether there were theatre-goers back then who complained that they didn’t have to stay in their seats for a couple of weeks on end. So why not just cut out the book stage altogether? I’ve not made a detailed comparison of Colm Tóibín’s The Testament of Mary and the play script brilliantly performed by Fiona Shaw a couple of years ago, but the text of the novella can’t be much longer (and different?) than the play. More recently Jeffrey Deaver’s audiobook The Starling Project has caused a bit of a stir, forgoing print form to go straight to full-cast audio. Apparently Audible plan about 30 of these performed audiobooks without any print versions (their site already reveals 820 hits for a search on “full cast”). Len Edgerly at The Kindle Chronicles has an interview with the author, from 26 December 2014, in which they discuss the project. A New York Times story about it can be found here. I would have bet there’d a print version of The Starling Project within the year. After all why not? If you can sell it to another slice of the market, why wouldn’t you do that? However I see no sign of it yet, ten months after publication. You’d have thought Deaver had print fans. GalleyCat brings us news of Banned Book Week, which this year will take place from 27 September to 3 October, and will focus on Young Adult books. Unsurprisingly, in a world where even teenagers are not being allowed to walk unaccompanied to their soccer games, “we” spend a lot of time trying to protect them from the pernicious influence which so often sneaks in between the covers of a book. That conservative parents spend so much energy worrying about little Snookums’ reading material is of course a back-handed affirmation of the power of the written word, even though it often manifests itself in what look like quite hilarious protective bans. Librarians are loud in their protests against having to catalog books acquired as a result of patron-driven-acquisition policies which are incomplete, duplicative, roughly scanned, and lacking all bibliographic information. Nowadays you can cobble together any likely looking public domain stuff and offer it for sale on-line. Print-on-demand means you don’t have to hazard any investment in inventory (except for a set-up charge) and can just wait for the unsuspecting to buy your edition of say Adam Smith’s An Inquiry into the Nature and Causes of the Wealth of Nations, which the innocent student might not even recognize as identical to The Wealth of Nations which is already on the library’s shelves. When for their $27.95 the librarians receive this badly scanned, apparatus-less, bibliographical-data-free offering with several sections missing, they naturally get annoyed at the waste of time and money. Last night I had a dream. I dreamt I was up a ladder in a large book-lined room trying to get a book. A huge 3-volume set became dislodged and ended up balanced on my head. I threw down the books, each as large as three eight-year-olds or one of those old electric switching boxes (if that’s what they were) we used to see on the street, and screamed that these tomes should be thrown away. My colleagues — because this appeared to be a publisher’s production office — remonstrated with me. So much work had gone into the compilation and production of these out of print volumes that we had to keep them: and that was indeed the rationale behind much of the dusty library stored around our hangar-like office. We all in academic publication have been involved in a few at least of these books. Massive compilations of second-rate Soviet science brought to the eager attention of a Western audience and so on. Luckily for me I worked only in respectable places, so such fare was rare, but after the War it was a popular way of feeding the free-world frenzy for library materials. A company like Pergamon Books became a hot property largely by the quick and dirty translation of masses of recently liberated Eastern European scientific papers. I suppose the librarians of the day happily cataloged it all and gave scant thought to how often the material was used. Polder Management and Alder Forestry Practice in the Pripet Marshes edited by Gazumov and Razumov might look like a respectable publication, but as nobody ever opened it, nobody ever knew. Rick Anderson on The Scholarly Kitchen takes off on academic journals which masquerade as serious while retailing garbage. He sees the phenomenon as having expanded with the increase in open-access journals where the poor author gets to finance publication. Of course we disapprove of it, but aren’t the problems we are having with deceptive publishing just a sign of the times, a consequence of technological change, which always opens up avenues of exploitation to the unscrupulous. The move from script to print allowed dubious editions to be run off. In the 19th century the development of the rotary press and cheap paper led to an explosion of piracy, particularly in America. The development of offset lithography, especially the paper plate small press variety opened up a world of piracy in the “East” which only became easier with digital printing. The Internet presents us all with simple mechanisms to become pirate publishers, or publishers of stuff with minimal value. The long and the short of it is that the buyer needs to be aware. I doubt if the supply is going to go away. So librarians shouldn’t just order stuff because any old customer has requested it. Think about it before you spend your money. And if the response is that we just don’t have time to do that, then stop complaining. If you’ve set up a system you don’t like and you won’t change it, then maybe such errors of purchasing are a reasonable charge to bear. Nobody need open the deceitful book, as, just like my dream colleagues, you will of course be reluctant to throw it away. “Do not assume a publisher has an interest in your book selling well. They should, but they don’t. Their interest is in seeing which books unexpectedly hit. That’s it. If it’s not you, you’re screwed.” Thus Carolyn Jewel: Writer’s Diary telling of her difficulties in getting rights reverted from a failing publishing house. This does sound achingly familiar: we publishers make life and death decisions about hundreds and thousands of books as if they were SKUs, not the result of years of work on the part of a sensitive individual. But of course it can’t really be any different. If it were we’d all be self-publishers, which may be the best way to go if you haven’t got a potential blockbuster. Big publishers just have too many books in their catalog to lavish individual attention on all of them; plus we know from bitter experience that most of the books will “fail” — where success is measured by the achievement of large sales. But publishers are by nature optimists, or they wouldn’t be in this business, so they are always reluctant to give up the right to try again — even if they never get around to doing so in the case of your book. In the old days when we didn’t have POD and e-books, reversion could occur when the book went out of print. But that stage is now never reached, so if you haven’t got some clause in your contract specifying some level of sales, some date beyond which, or some mechanism for the right to publish to revert to you, then it won’t. Ever. If the publisher goes out of business, look out. Your book is an asset of the company and has to be made part of the bankruptcy proceedings. The problem of getting your rights back from a failing publisher was being ventilated last year because of the problems at Ellora’s Cave. This post from Vulture explores the possibility that it was Amazon that dun’ ’em in. (The picture alone is worth the click-through.) It would seem that their bankruptcy scare is now less pressing: maybe they are finding they can compete with Amazon after all. Ellora’s Cave is still trading, and had a large impressive booth at this year’s BEA. But apparently rights reversions to the author within 12 months prior to a company’s going into bankruptcy can be regarded as fraudulent, so authors have an unexpectedly large investment in the health of their publisher. Clearly the right course of action is to refuse any clause that restricts your right to a reversion of rights and insist on one which specifies in some detail the conditions under which that will take place, right by right, but that doesn’t help much in the real world where authors’ negotiating power is so much less than the publishers’. The site Writer Beware® gives solid advice on how to request a reversion. The Authors Guild is agitating about a whole raft of contract issues, and rights reversion is one of them. This all makes sense of course . . . but this is a lopsided negotiation, so good luck to any but the most powerful bestselling authors. Here’s a link to the Authors Guild announcement of their Fair Contract Initiative. Scott Moncrieff’s title Remembrance of Things Past is well know as not being a direct translation of the title of Proust’s A la recherche du temps perdu, but an atmospheric equivalent culled from Shakespeare. Translating titles turns out to be a more complicated art than one might have imagined. Titles like War and Peace, Pride and Prejudice, Bleak House are fairly straightforward, but it doesn’t take too much effort to think of titles which just can’t be translated into a foreign language. Les Misérables is directly rendered, untranslated, into most languages, with or without the accent. The equivalent just takes too many words to render. “The poor, wretched, miserable people” just doesn’t have a ring to it. The Germans, with customary thoroughness have translated it as Die Elenden, but seem always to include, as a subtitle almost, Les Misérables. It’s just been translated into Urdu, where its title is Mizraab, which I’m guessing means something similar. Notre Dame de Paris almost sounds more interesting as The Hunchback of Notre Dame. Of troublesome titles Catch-22 is a good example discussed in this OxfordWords blog. It’s an invented idiom, which sets the translator an almost unsolvable problem. One of the surprising items in that blog post is how Steig Larsson’s Millennium series, The Girl with . . . , has that unifying title form in the English translated versions only, not in the original. 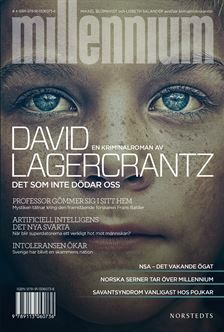 The latest book in the series, The Girl in the Spider’s Web by David Lagercrantz, has the Swedish title Det som inte dödar oss which translates literally as “That which does not kill us”. France goes for the fairly literal, Ce qui ne me tue pas; Spanish follows suit a bit more accurately, and expanding it, with Lo que no te mata te hace más fuerte; Italy and the Netherlands follow the literal path with Quello che non uccide and Wat ons niet zal doden. I wonder how Nietzsche feels about all this. Tactfully perhaps the German publisher has chosen the title Die Verschwörung (the conspiracy). Perhaps surprisingly the English translator of the latest book has been changed as well as the author. The first three books were translated by Reg Keeland; the latest one by George Goulding. I would have thought that continuity of translator would have helped to gloss over any stylistic differences between the “real” Larsson and the new one. Goulding seems however to be David Lagercrantz’s regular translator which no doubt explains the decision. And the answer, after recourse to Wikipédia, is Pascal in his Pensées, Fragment 142. For the troubled translator the real question is how well do French people know this, or would most of them have to go through the same sort of search? As far as I’m aware there’s no direct English equivalent tag regretting the idleness of royalty: maybe we cared less about whether our rulers were bored or not. Perhaps I need to look in Alice in Wonderland. As a quotation, familiar one assumes to some educated French people, it’s a bit like Ill Met by Moonlight, the title of W. Stanley Moss’ book, turned into a film starring Dirk Bogarde, and covering a World War II escapade eventually recounted by the true protagonist, Patrick Leigh Fermor in Abducting a General, to be published by New York Review Books in November. Do you translate that title, leave it as is because “everyone” knows it, or look in the standard French edition of Shakespeare, and take what they say there in Le songe d’une nuit d’été as the title? I just don’t know. My skimpy, casual research suggests that in the case of Un roi sans divertissement the answer is no, the French don’t recognize the title as having any significance Pascalian or otherwise. A film was made under that title in 1963, but who remembers non-blockbuster films from back then? Maybe I have to go to the library and look up the standard translation of Pascal — but then of course I know that would certainly not be a tag familiar to most educated folks. None of the versions I can think of sound exactly convincing. “A king with no pastime” is pretty blah; “A king without diversions” sounds a bit traffic-report like. “A king with nothing to keep him busy” is the right sort of sense, but is surely clunky. Maybe “A king with nothing to do”? “A king with nothing on” might best be avoided. Part of my problem is that I suspect it’s not really a great title to have given the book in the first place: true it’s about an energetic detective, bored in his retirement, taking over-active action in an old murder case. But to me the dragging in of royalty just colors it too much. “A king with idle hands” or a translator with empty mind. “Idle hands: devil’s work” may be it, but it floats free of the original. France’s law authorizes the publication of OP orphan works without the permission of the (unfound) rights holder The IPKat informs us. (Link via The Digital Reader.) This seems to me entirely desirable, and shows that the French are as usual more concerned with preserving their culture than with the strict enforcement of individual rights favored in the Anglo-Saxon countries. Vive la différence. It appears though that this situation may be incompatible with EU law. Must we look for a Frexit after the narrowly averted Grexit, and the imminently possible Brexit? The French for “out of print” appears to be épuisé, “exhausted”. Exhaustion is no longer a condition against which publishers have to struggle in quite the same way. We used to have to write endless, exhausting letters to authors explaining to them why we couldn’t afford to reprint their book in spite of their certainty that civilization as we know it would cease if this particular work were to become unavailable. Our recently devised cunning trick of keeping a book in print for ever, first by tiny reprints and finally by making it available through print-on-demand, has meant that authors never get to reacquire their rights. If the publisher has a license to publish, it used to lapse when they were no longer “publishing” the book, i.e. when it went out of print. The sales potential of many books is of course exhausted itself by that point, making the reacquired rights virtually worthless, but some few would still offer potential income to an author eager to republish elsewhere, especially in an updated edition. Now as the book never goes out of print, the publisher is still “publishing” it, even if only one copy is sold every few years. It is this change in the meanings of “in print” and “out of print” which makes calls for an expiration clause in publishers’ author-contracts suddenly relevant. Of course nobody should expect the publishing industry itself to decide collectively to “do the right thing” — such collusion would in any case be illegal — so it seems unlikely that we will any time soon stop hiding behind our usage of “in print”. While it used to mean that you could theoretically turn up at a warehouse and see one or more physical copies of a book, now it just means that although we may not actually have any copies on hand we could at any moment print you one. So “in print” has now freed itself from any strict reference to printing, and just means “available for sale” — a condition which used to be synonymous with the literal sense. Of course the French are more direct: in print for them is disponible “available”. Terms are just terms, and we can’t always expect them to be literally accurate. “In print” even in the days before POD was never the exact opposite of “out of print” in the way that “available for sale” would be the exact opposite of “no longer available for sale”. The idea of the availability of an e-book meaning that the book is in print is just another layer of absurdity. The Bookseller‘s FutureBook blog suggests that the situation is different in Britain where publishers are readier to negotiate expirations of leases of rights. I’d be surprised if the French weren’t similarly inclined. I wrote about In print and out of print in the early days of this blog, back in 2010. Another reason to vote SNP? There’s a proposal to give every child in Scotland a library card automatically. The BBC tells us that our First Minister, Nicola Sturgeon, is backing the proposal from Glasgow’s Mitchell Library that all kids should get a library card either at birth, at age 3 or 4 or upon entry into primary school. Of course we do all know you can take a horse to water, but will it read? Thanks to Shelf Awareness for making us aware of this story. Here’s The Bookseller‘s account. Bob Eckstein’s New Yorker cartoons of New York bookstores herewith. Part 1 here. Part 2 followed in October. 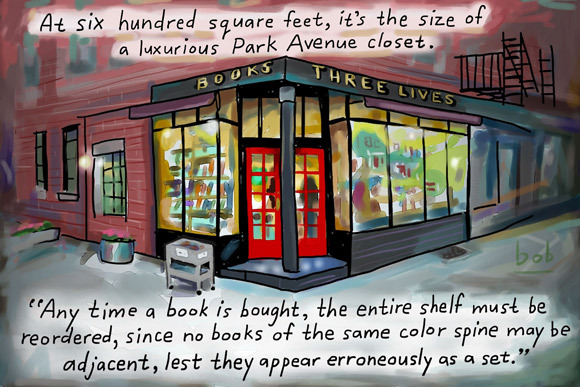 The word “reordered” is I hope ambiguous in the Three Lives (great store) cartoon. I think they mean rearranged, rather than taken away and reordered from the publisher! This would make making a sale a very risky undertaking. I have been waiting to see if there’s a part 3: I suspect not. In general one could say that our attitudes have changed by 180º since last year. We are now rather cocky about the fate of the bricks-and-mortar bookstore. Here’s a piece from The Week (link via Jose Afonso Furtado) explaining why bookstores are actually thriving. Another post, forwarded by Peter Ginna, this one from Untapped Cities, reports on the city’s top twenty independent bookstores. Three of these stores were represented at The Book Industry Guild May 2015 meeting on the subject of independent, niche bookstores. All, plus St Mark’s Comics, seemed to be in robust health. I suspect that our attitudes towards bookstores suffer from the same schizophrenia that characterizes our attitude to publishing. Just as the commentariat know that publishing is all about the Big Five, so is book selling all about the big chains. Borders is gone, and Barnes and Noble keep closing stores — so we must be in crisis. Yes?